If you want to explore Bali without a set itinerary, or if you want to go it on your own without joining up with an organized tour, you might want to consider renting a scooter or a motorcycle. 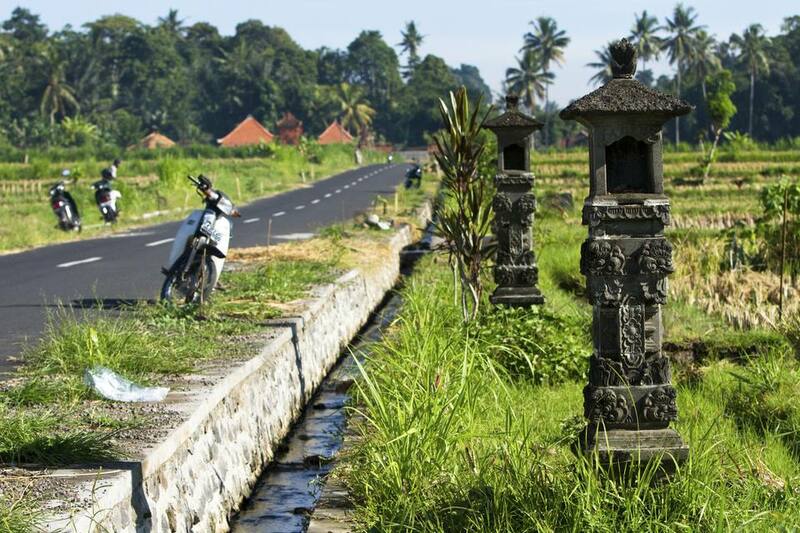 Rental motorbikes in Bali are relatively cheap. But before you sign up for one, you better make sure you’re really skilled at riding a motorbike. It’s not because the rental motorcycles in Bali are complicated; it’s the Balinese traffic situation that’s complicated. In Bali, the rules of the road are more like suggestions; the usual rules of right-of-way don’t apply, or they apply very loosely. In fact, right-of-way practically belongs to the bigger vehicle on the road. You need to honk at blind curves because an oncoming vehicle might be taking up the middle of the road as it careens into sight. And because many of the tinier lanes have only one-way traffic, you may need to go around a long way to get back to the same point. So if you’re the kind of take-charge, do-it-yourself traveler who has an international license and a willingness to face the risks of driving on chaotic Balinese roads, then, by all means, go for it. With a motorbike, you’ll be able to see more of the island on your own pace, and you’ll be able to strike onto the paths-less-traveled to see sights that most tourists never get to see. Helmet are compulsory for motorbike riders in Bali. Insurance, however, isn’t. "Insurance is almost never included," explains Bali travel expert Paul Greenway in his Bali & Lombok Tuttle Travel Pack guidebook. "You have to pay up big-time if the motorbike is damaged or stolen, and most travel insurance policies do not cover motorbike accidents." Motorbike-riding tourists are at a disadvantage in Bali, as foreigners are usually expected to pay up in the event of an accident—even if they aren’t at fault. Motorcycle rental costs vary, and are often negotiable, depending on how long you need it and the shape the motorbike’s in. Motorbikes tend to come with 100cc or 125cc engines. You don’t need more than 200cc to go thrashing about Bali on two wheels; the roads (and the traffic) don’t encourage speedy driving, anyway. Keep your motorbike keys on a chain or lanyard. Aging motorbikes often have loose keys, so they sometimes fall off the ignition while the motorbike is in use. Be careful at intersections. It’s not uncommon for drivers to not look carefully when turning into your road. Also, many drivers speed up when the yellow or red light goes on, increasing the danger for drivers unused to relaxed traffic rules in Bali. In Bali, the larger vehicle has right of way. So when it’s you versus a truck… the truck wins. Honk your horn when negotiating blind curves, as it’s not uncommon for drivers to drive in the middle of the road when approaching curves. Get a decent helmet; don’t get one of those glorified bicycle helmets often foisted by rentals on unsuspecting tourists. Note: Bali Bike Rental offers insurance coverage.